North-East England-based independent chemical manufacturer, Thomas Swan & Co Ltd will be expanding its range of formulated Elicarb® Graphene materials with a prototype product focusing on the manufacture of a carbon fibre composite prototype. Dimitris Presvytis, Advanced Materials Team Leader at Thomas Swan with the graphene carbon fibre prepreg prototype. 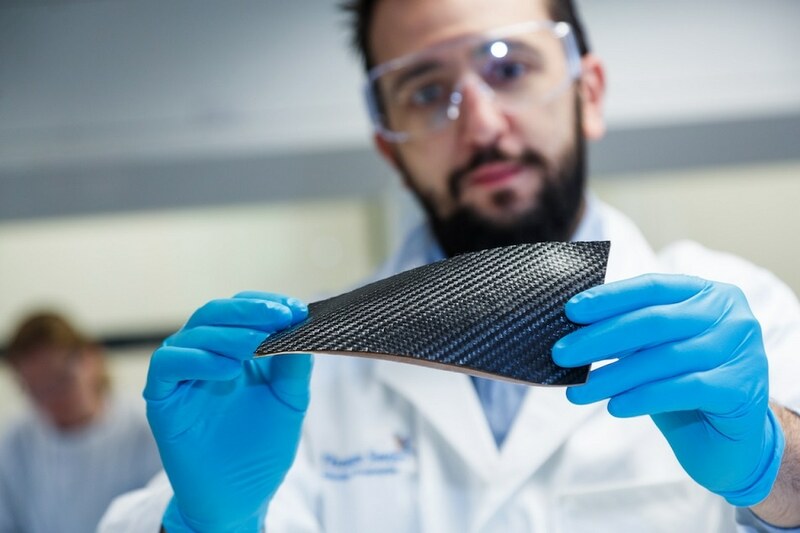 We have used our expertise in dispersing nanomaterials in thermoplastics and resins to improve the properties of a carbon fibre composite, this is an exciting development for the company. Initial independent testing with unidirectional carbon fibres gave very encouraging results. Adding 1% wt Elicarb® Materials Grade Graphene in the epoxy resin in the manufacturing of a carbon fibre laminate improved flexural strength and modulus. This gave the company motivation to move the development one step further and manufacture a commercially relevant carbon fibre prepreg (a woven cloth of carbon fibre pre-impregnated with resin). This prototype was prepared by working collaboratively with an established and experienced third party. Thomas Swan will continue to develop, test and improve these materials and will work with selected partners to turn these into products over the coming months. Samples of these materials are going to be made available to companies interested in working with Thomas Swan. This represents an exciting step forward for Thomas Swan’s Advanced Materials division; these materials have a range of potential applications, including lighter body parts in high performance automotive applications, sporting equipment and perhaps ultimately in aerospace. On the 2nd of November, Harry presented a case study: From Concorde to Composites – our graphene story, at the HVM 4th Graphene & New Materials Conference in Cambridge.